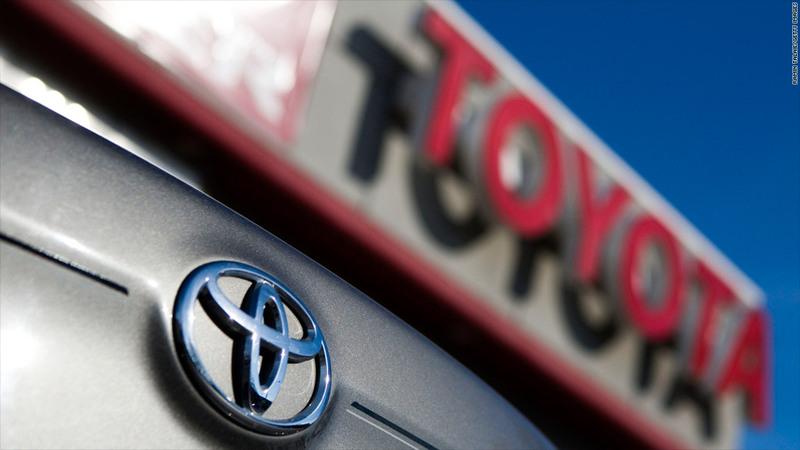 Toyota Motor is set to overtake General Motors and reclaim "the world's biggest car maker" title for 2012, after a bumper year of sales at home and abroad. Despite a series of recalls, a record U.S. safety fine, and a boycott by some Chinese buyers from a territorial dispute, the Japanese carmaker said Wednesday its worldwide sales should rise 22% this year to 9.7 million vehicles. Excluding cars sold by its subsidiaries, Daihatsu and Hino, sales would total 8.68 million. Toyota (TM) has staged its comeback after losing the top spot to GM in 2011, when sales and production were hit by Japan's earthquake and tsunami. Toyota's gains came from a rebound in domestic sales and strong performance in its Lexus and Camry models in the United States. Vehicle production at the Toyota group is up 26% at 9.9 million vehicles in 2012. General Motors' (GM) global sales in the first three quarters of the year totaled 6.95 million vehicles, putting it narrowly ahead of Toyota. Volkswagen AG (VLKAY), which includes both the VW and Audi brands, was a close third. However, sales in the last three months have put GM on pace for full-year sales of about 9.3 million. VW Group sales are set to top 9 million vehicles worldwide. Toyota and GM have been neck and neck for the top spot in recent years. Toyota beat GM in global sales for the first time in 2008, when the recession and high gas prices left the American automaker on life support, with both federal bailouts and bankruptcy looming. But in 2011, GM sales rebounded to 9 million vehicles just as Toyota's production was hobbled by the earthquake and tsunami in Japan, allowing GM to recapture the No.1 spot. Toyota is predicting further growth in 2013, despite stagnation in Europe and Japan and uncertainty in the U.S. from the effect of fiscal cliff-related spending cuts and tax increases. Toyota said Wednesday it expected worldwide sales of Toyota and Lexus brands to grow in 2013 by 3% to 8.9 million, and overall group sales to grow by 2% to 9.9 million. Toyota is hoping that international sales will drive growth next year. It expects Japanese sales to fall 15%, following the expiry of government subsidies for low-emission cars, which could lead to a reduction in pent-up demand.